LASER TREATMENT MAY BE USED TO TREAT SPIDER VEIN AND VARICOSE VEINS ON THE LEGS, AND SPIDER VEINS ON THE FACE. Lasers send wavelengths of light directly into the vein. This causes the vein to heat up internally and turn into scar tissue which will gradually fade or disappear. Technological advances in the recent years have helped to make the laser treatments safer and more effective than ever. Like sclerotherapy, such treatment can be performed in a dermatologist’s office and does not require anesthesia. Many types of lasers are used to treat veins for different skin types. Your dermatologist will recommend the best type of treatment, based on the size and location of the veins to be treated. For best results, laser therapy may be combined with sclerotherapy. To prevent permanent skin discoloration, people of color may require treatment that emit specific wavelengths of light. 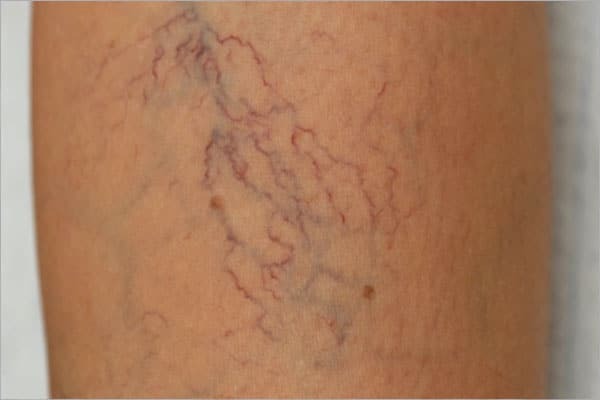 While generally spider veins completely disappear, new spider veins may re-appear in the same general area and it is also possible for large veins to re-occur. The pulsed dye laser is a device that produces a bright light that is absorbed by abnormal blood vessels, which are destroyed without damaging the surrounding skin. It uses yellow light, which does not result in any long-term skin damage. Sclerotherapy is a popular treatment option used to treat spider and varicose veins on the legs and spider veins on the face. Ineffectiveness. The treated vein remains despite treatment. Discoloration of the skin. Treated skin may become lighter or darker than the surrounding skin. Often this will disappear within a month or two, but it might be permanent. Bruising. Temporary bruising may occur. Side effects may vary with the type of treatment selected. Your dermatologist can explain the potential side effects for each one.